Marigolds are indigenous to the Americas and are one of the most popular bedding plants for home gardens and landscapes. Their bright orange, yellow and red blossoms make them a cheerful addition to the garden, where they can be massed for a solid color effect. Their frequent blooming and rapid growth also makes them a favorite flower. Marigolds are of the plant genus Tagetes, one of 51 annual and perennial plants in the daisy family. The various types of marigold have green pinnate leaves and white, golden, orange or red flower petals in a ray or disc floret shape. 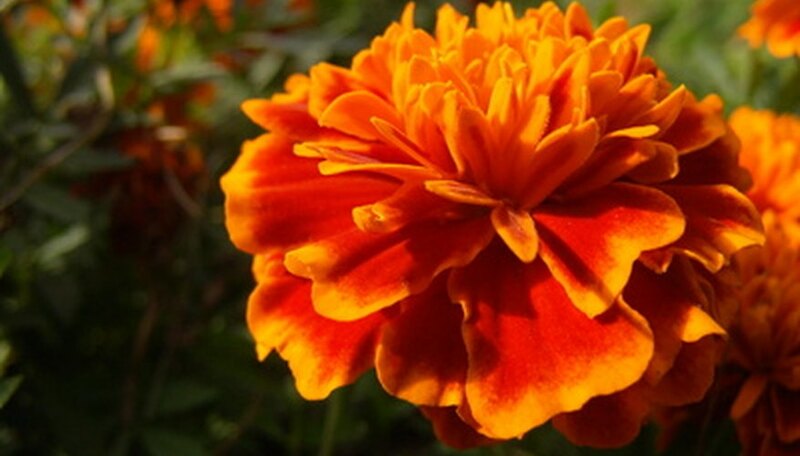 Many species of marigolds have a distinctive musky, pungent scent. The scented oils that the flower exudes repel harmful insects. They are an annual plant that is also classified as an herb. 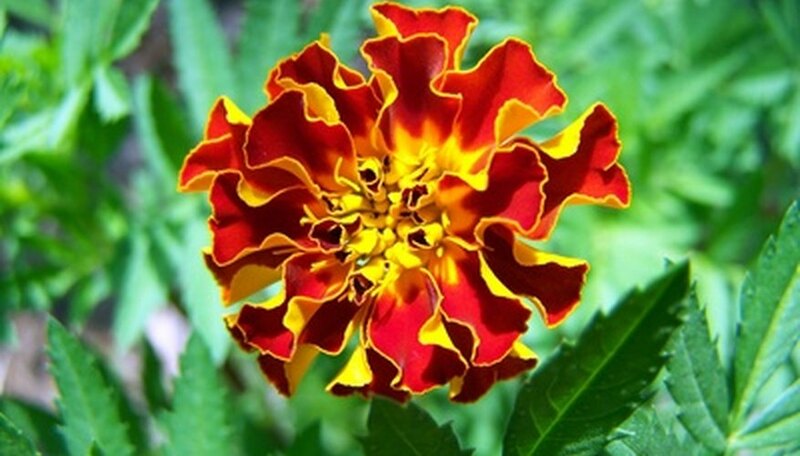 Tagetes patula, L. is the familiar variety known as a French marigold. It is a dwarf, compact variety that has the most color variation in the species. Some varieties are bi-color, most frequently mahogany and red or orange and gold. Mahogany red marigolds are always the French variety. Another identifying factor is a petal edged with a contrasting color. French marigolds are the most popular type in home gardens because they are easy to grow in any soil type and are reliable bloomers. Marigolds are often used in companion planting, which is the science of plant pairings to help control disease and insect infestation. 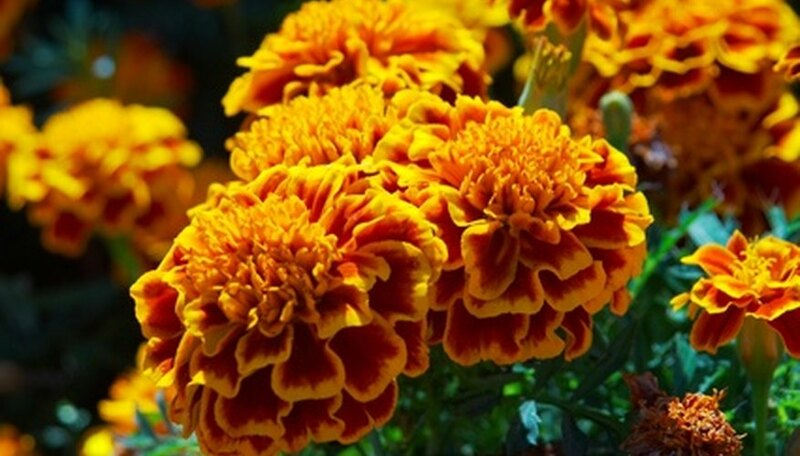 Marigolds are used to repel harmful insect pests on vegetables such as squash, tomatoes, eggplant, potatoes and beans. They release thiopene, which is a chemical repellent for nematodes (worms). Marigolds repel aphids and the whiteflies around tomatoes. It also kills bindweed, one of the most common weed problems in vegetable gardens. Marigolds are grown easily from seed sown directly in the ground in April and May in a sunny location. Garden centers also sell small started plants in spring. They grow well in normal garden soil that is mixed with compost and is well drained. Marigolds grow rapidly and are not usually insect-prone.